At a local bar, three friends, Mr. Green, Mr. Red and Mr. Blue, were having a drink. One man was wearing a red suit; one a green suit; and the other a blue suit. "Have you noticed," said the man the blue suit, "that although our suits have colors corresponding to our names, not one of us is wearing a suit that matches our own names?" Mr. Red looked at the other two and said, "You're absolutely correct." What color suit is each man wearing? 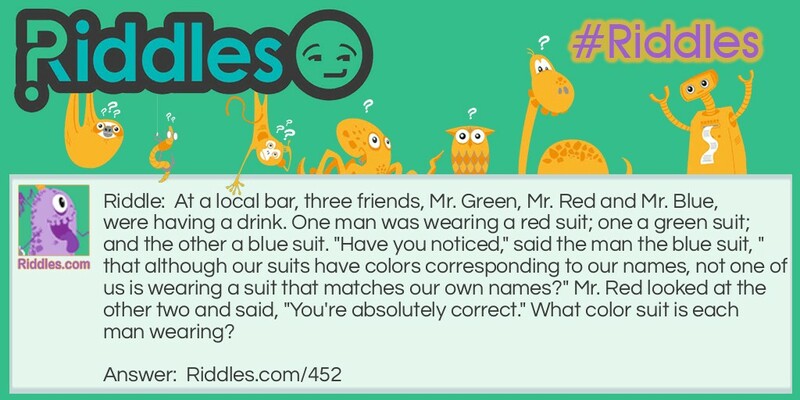 Men and Suits Riddle Meme with riddle and answer page link.